There you are in class and you write on your whiteboard (or chalkboard, I hear those still exist) the most perfect explanation of whatever it is you explain. Wouldn’t you love to be able to save that to share with future students? Or perhaps you’re part way through the material you want to cover when class ends. Don’t you wish you could save what you’ve written so you could start there next class? Do you find that the linearity of PowerPoint is starting to wear you down? Wouldn’t you love to just point at a spot on the screen and zip to the slide you want? Or wouldn’t it be nice to access the internet without moving from the front of the room? 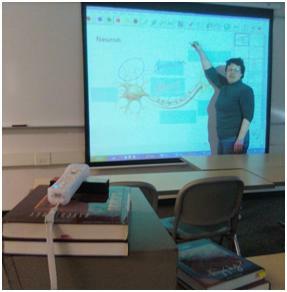 Don’t you wish you had a few thousand dollars laying around for a smartboard? If you already have a Wii remote, then that’s free. The price of this project just dropped to practically nothing! *This cost does not include the $8 soldering kit, the $7 for the spools of wire, and because some parts are sold in pairs, you’ll probably want to make two pens. Before we play MacGyver, I’m going to send you to watch Johnny Lee show you how this works in a 5-minute TED talk video. If you like what you see, come back, and I’ll get you set up with everything you need. We’re going to use a Wii remote to act as the conduit between your classroom’s screen and your computer. We’re going to use an infrared pen to tell the Wii remote what to tell the computer. In short, we’re going to do what Lee did. If you combine this Wii remote setup with Classroom Presenter (see my 4/14/2009 blog post), you will have a powerful interactive whiteboard. 1. Wii remote. That’s easy. You can use the one that came with your Wii – you’re not going to do anything to it other than tote it to class. It will still work just the same way with your Wii system. You don’t have a Wii system? You can buy a Wii remote wherever game systems are sold. 2. Infrared pen. This is a little harder. You can order them online from $8 to $30. IRPensOnline and Penteractive are two such sites [Update: Some sellers have pressure-activated pens if you’d rather not use a thumb switch]. (Disclaimer: I haven’t used either retailer. Sites are provided only for informational purposes.) Or you can make your own (thus the trip to Radio Shack). I used the instructions from Ken Moore of Ken Moore Design. He includes a how-to video, written instructions, and a (printable) Radio Shack shopping list complete with part numbers. I opted to use a dried up EXPO dry-erase marker because we seem to have those in abundance. You know where to find them. In your classroom, it’s usually the first one you pick up. Because some of the parts you need are sold in pairs it makes sense to make two pens. You should always have a back-up anyway. Tips for making the pen. a. Ken’s shopping list doesn’t include wire. I used 22-gauge – definitely something on the smaller side is better. Wires have to be stuffed into the marker with the battery holder so the smaller they are, the easier everything fits. b. When he says that force is needed to get the LED holder into the tip of the marker, he is not joking. I used a drill to bore the tip to make it a little wider, particularly around the opening. I think this made it easier for the threads of the LED holder to bite. Once they did, screwing it in wasn’t hard. Lots of force to get it started. Seriously. c. For my pen, small, needle-nose pliers will be needed to change the battery. I’ll worry about that when the time comes. d. One person recommended a daub of super glue to hold the LED in place in the holder – not a bad idea. e. Since the LED is infrared, by definition, you can’t see it when it’s lit. Please remember this after you followed the instructions to the letter, push the switch, and nothing seems to happen. Dig out your digital camera or flip on your cell phone’s camera, press the pen’s switch, and look at it with your camera. If your pen is working, you’ll see the light through your camera’s viewfinder. 3. Smoothboard software. This is what allows your Wii remote to talk to your computer. It’s not the only software out there, but it has a lot of functionality so it’s the one I recommend. It’s free for educational use, but when you run it, you’ll have to wait 10-15 seconds before the “continue unregistered version” option becomes available. 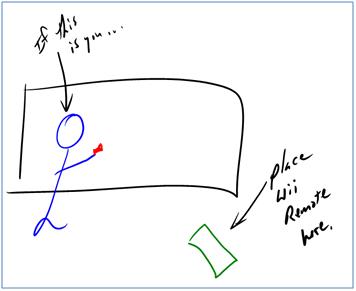 If you like the software, send them $30 to register it.In this blog post, I’m going to just talk about the basic setup, but know that with Smoothboard, you can use a second Wii remote placed in a different spot for redundancy (if you’re standing in front of one, the other one can still ‘see’ the screen; this may also reduce the choppiness that sometimes happens, but I haven’t tried it) or you can use a second one as a ‘presenter’ tool. The latter seems like too much work to me, but you can read the Smoothboard manual and decide for yourself. 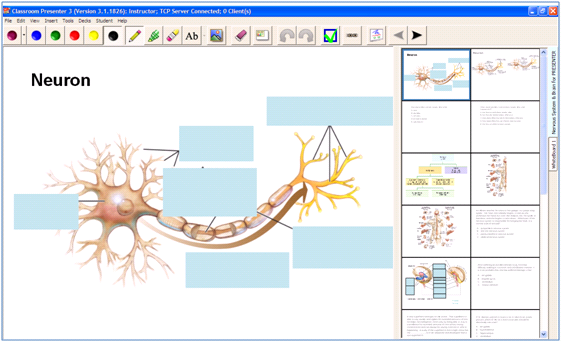 Load your PowerPoint into Classroom Presenter. Take your infrared pen and, in the toolbar, ‘tap’ the pencil, and write on the slide. Change colors. Switch to the highlighter. Erase individual marks or the entire screen. Quickly ‘tap’ any of the slides on the right to show a new slide. Open a blank screen. When you’re done, save your file, and open it again next class. Or you can save it as html and upload it to your website, course management system, or email to your students. If your computer is WiFi-enabled or is connected to a WiFi network, students with (PC) laptops who are running Classroom Presenter can see your slides on their computer, get your annotations in real time, make their own annotations, and save the file at the end of class. And they can send slides to you in real time, and you can display them for the class. But I digress. For more on this program, again, see my 4/14/2009 blog post. 1. Connect your Wii remote to your computer via Bluetooth. Open your computer’s Bluetooth manager, and tell it you’d like to connect a new device. Put your Wii remote in ‘discoverable’ mode. To do this, press and hold the 1 and 2 buttons at the same time. As long as the lights are blinking, it’s ready to be discovered. It will appear in your list as Nintendo RVL-CNT-01. Any time you want to connect your Wii remote, press and hold those 1 and 2 buttons again and then double-click your new Nintendo option in your Bluetooth manager. Presto. It’s connected. 2. Turn on your classroom projector. Once your computer’s screen is displayed, you’re ready to go. 3. Place your Wii remote. This will require a little trial and error to find the best location. Notice the circle with the crosshairs in the top left corner? Walk up to your classroom’s screen, put the tip of your infrared pen in the center of the circle, and press the switch. If it’s in your Wii remote’s line of sight, the circle will disappear and then reappear in the top right corner. Repeat this process for all 4 corners. If the circle doesn’t disappear, make sure you’re not standing between the pen and the remote. If you’re not in the way, then that spot is not covered by the Wii remote, and you’ll need to adjust the remote. This is the Smoothboard interface that shows the battery level on your Wii remote. You can also choose whether you want to use the remote as a whiteboard (which is what we’re using it for) or as a presentation device. I haven’t tried this latter use, so I’ll leave that for someone else to write about. The “Cursor Control Toolbar” puts a little floating toolbar on your screen. Clicking those buttons allows you to do things like mimic a mouse right-click. Very handy. The gray box at the bottom shows the area covered by the Wii remote. The white space shows the area you’re using. The more white space within the gray box, the better. This is telling me that I won’t be able to access the very bottom left of the screen because it’s outside the gray box. 5. Run Classroom Presenter, or whatever other software you’d like. Your infrared pen, when the switch is pressed, now acts like a mouse controlling your cursor. Open programs. Open websites. Write on the screen. Anything you can do with a mouse, you can now do with your infrared pen. Writing takes some getting used to. To print words, press the button on the pen, draw your line, stop pressing the button. Repeat for each line. If you write in cursive, you’ll likely have an easier time since each word is one big line. Precision isn’t this tool’s strong point. Think of it as writing with a crayon. If you have the money, by all means go with a smartboard or a TabletPC. If you’re looking for some impressive functionality for a cost that is almost covered by the change in your couch, it’s worth trying out. If you decide to give this a whirl, let me know how it goes! Way cool. I think I might actually try this because I’ve already got the Wii remotes. Wow, you sure did get quickly onto it Sue! There’s a link from the Smoothboard site that shows pens you can purchase that have a pressure activated LED making it great for writing as it writes when you press down and stops when you lift off. They even had one that had both pressure sensitive LED and switch. Being lazy, I’m going to get some of those shipped over to see how they go. I’ll be using the presenter as well then recording presentations using ePresence (www.epresence.tv) out of University of Toronto. I’m a computer teacher, and was wonding if this will work for running Word, Excel, PowerPoint from the board. Can I “click” on Open with the pen, edit and copy, etc., will it complete these operations, or does this only work within the downloaded software? When you run Smoothboard, whatever is on your computer screen is displayed on the classroom screen. The pen acts as a mouse regardless of what program you’re running — Excel, Word, Powerpoint. So, yes, run Smoothboard and open Word, etc. If you try it, let me know how it works for you! Smoothboard will work on any application that can receive the mouse and keyboard input. In PowerPoint, you can start your slideshow easily by clicking on the floating toolbar or outside screen toggles. Then, you can change slides just by clicking on the arrow button with the preset settings for PowerPoint. There is also a built-in annotation tool that will allow you to write on top of any application such as your internet browser, Word, and PowerPoint. Thanks for all the times. I bought some pens that arrived today and have been testing out Smoothboard with my laptop. Hopefully I will be able to calibrate easier with my projector in the classroom. I have my projector on a tripod and am hoping I can attach the wii to the projector. Excellent! Keep me updated on how it works for you! Can I use the Smartboard software already loaded on my machine instead of Smoothware? 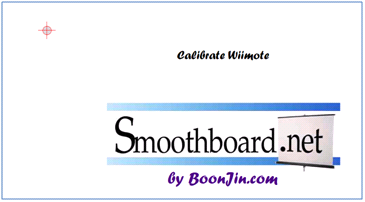 The Smoothboard software allows you to connect the Wiimote and turn your ordinary screen surface into an interactive whiteboard with an IR pen. As Smoothboard can work with any application that uses the mouse and keyboard, you should be able to use your current Smartboard software too. I don’t have a projector and don’t want to buy one, i am going to try this tomorrow “blind” . You can point the Wii remote at your computer monitor, in effect turning your computer monitor into a touchscreen. Have fun!